You know what, it's not just you. I deleted the old one, uploaded yours and cleared the cache. Same old image. The reason we should be removing them? 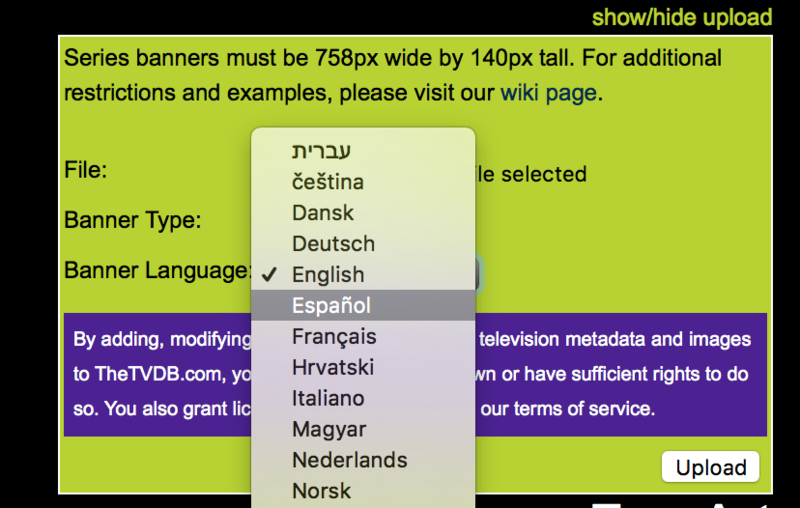 When you upload images to the site you will have the option to choose the language. Happens all the time, one person does it and everyone assumes it's correct. I watch the show and it is in 16:9 as you say. I've marked them all to be replaced. Don't feel you have to change them all, other people are likely to come and replace them. I will message that user if they reappear. Do we have live panels attached to lots of shows? They seem particularly tenuous to attach to a show. I don't think they should be there.